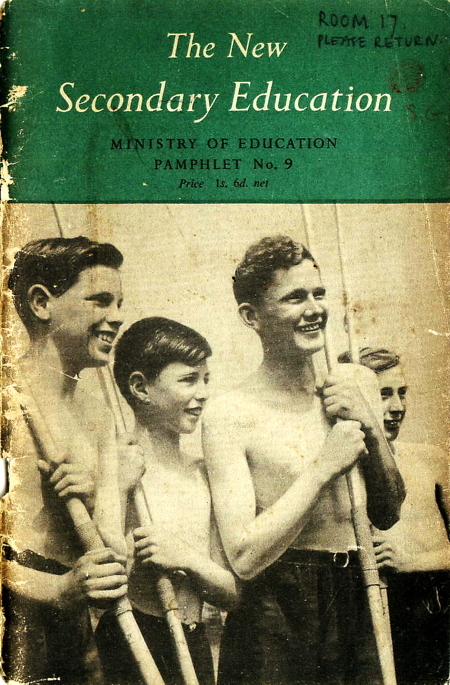 The Nation's Schools had set out the arrangements for the 'tripartite' system of schools - grammar, technical and secondary modern - for the new secondary education following the 1944 Education Act. Labour Party members were furious and Minister of Education Ellen Wilkinson withdrew the document. But as a result of intense pressure from education officials, the policy remained the same and was restated in The New Secondary Education (1947). Written by Wilkinson before she died, it was published by her successor, George Tomlinson. The complete text of The New Secondary Education is shown in this single web page. The New Secondary Education was prepared for the web by Derek Gillard and uploaded on 30 January 2017. The main credit for this pamphlet should go to Ellen Wilkinson. It was under her direction and stimulus that it was written, and before she died she finally passed the proofs for publication. The Foreword which follows was the last thing she wrote and is typical of her courage and vision. All I need add is that there is nothing in the pamphlet which I would have wanted otherwise. It does not pretend to say the last word about Secondary Education: but it does give a clear statement of policy in a field where there has been some confusion of counsel. I hope it will be widely and carefully studied. THIS pamphlet tells the story of a great adventure and a great investment. Part of the work is in being, as the pictures show. Most of it consists of plans for the future, but the immediate future. Here is no blue-print of Utopia. It is a description of work in progress. This work is the boldest investment in manpower, money and materials that any war-crippled nation has ever made - an investment in the children, the citizens of the future. The end of the war found Britain with a great debt, with many schools ruined by bombing, with many schools condemned years before the war, and others dilapidated by war usage and lack of repair. Above all was the clamant demand for labour, even child labour. But the end of the war also found Britain with a new Education Act passed with the blessing of all the great political parties. At the end of the first World War also there was a new Education Act. And the Britain of 1918 was not so poor as the Britain of 1945. There were still large foreign investments and an intact Empire. Yet the Education Act of 1918 was almost the first casualty when the cry for economy was raised. How extravagant that economy at the expense of the children's future has proved to be! Here in this pamphlet is an answer to the pessimists who fear that the same may happen again. There will, I know, be objections from various groups and interests to the plans for secondary education sketched in this pamphlet. And, oddly enough, the basis of all these very different criticisms will in practice (though not in theory) be the same - the fact that these plans put the child first; that their variety is designed to suit different children, not different income groups; and that they aim at educating the child by the awakening of its interest. about discipline and from employers who write to the newspapers that because of all this new-fangled teaching they cannot get boys and girls who spell and write decently. Some employers have been saying this ever since elementary education became compulsory. They said it even when children were taught nothing but the three R's, and most of that with the cane. Isn't it time we tried the more logical way - so to interest children in their own language that they cannot help spelling and using it correctly? Those who are not and never will be so interested, is it not better to let them find the things they do like and therefore can do well, even if that means that instead of spending a life of unhappy frustration on an office stool or at a teacher's desk they get fun out of a carpenter's bench or a bricklayer's trowel, or satisfaction out of the risk and adventure of the mine? By the greatest good luck we are launching this great programme at just the right moment. Because of the financial arrangements now made, no child need be denied by reason of its parents' income the type of school best suited to its ability. But for this scheme to work satisfactorily something else is needed. No child must be forced into an academic education which bores it to rebellion, merely because that type of grammar education is considered more socially desirable by parents who could afford to pay for it. This means that there must be parity of esteem between the different types of school. Can that be any more than a phrase - even if buildings and size of classes are equalised - unless there is some parity of social esteem for the avocations to which the children go from the schools? As this pamphlet comes out, the British people are learning by the hard way how dependent is a civilised community on its farmers, transporters and miners, its manual and technical workers. Incomes and hours of work are being adjusted accordingly. Clearly this is bringing us to a saner way of life. Those young officers who have gone down the pits on demobilisation or led the way to the farm and the factories, refusing "press-pity", have underlined this social change in the most effective possible way. True, a few pioneers do not make a revolution. But the change in the public attitude to the craftsman and the technician is nothing less than revolutionary, and it has taken two world wars to teach the lesson. I am emphasising this because it is the answer to those who think that secondary education for all must mean a grammar school education for all, and that the secondary modern and secondary technical schools are merely devices for keeping intact a class system of education. The prejudices of three hundred years cannot be eradicated by one Act of Parliament, nor their effects wiped away by one administration, especially while labour and materials are short and mountains of arrears of building repairs and re-equipment are waiting to be done. Until education in the State secondary schools is as good as the best that money can buy outside the State system, so long will inequalities remain. For that matter, even when that end has been achieved, if people prefer to pay high fees for education less good or no better than that which the State provides free of charge to its taxpayers, there is certainly no reason, in a free country, why they should not spend their money in that way. Variety in education is a needed spice. But no State money will go to a school which does not provide places for children from the State primary schools either free or for fees paid by the local education authority. As I have said on the platform, it will take a generation to implement fully this great scheme. During that time alterations will be needed, improvements will suggest themselves. New problems will arise. Everything to do with children must have room to grow. It is important not to make plans that are too rigid. Education in the past has been cursed with well-intentioned attempts to control the generations yet unborn. The schools must have freedom to experiment, room to grow, variety for the sake of freshness, for the fun of it even. Laughter in the classroom, self-confidence growing every day, eager interest instead of bored uniformity, this is the way to produce from our fine stock the Britons who will have no need to fear the new scientific age, but will stride into it, heads high, determined to master science and to serve mankind. Note: The photographs have been taken at secondary schools situated in different parts of the country. They have been chosen in order to show something of the variety of work which is being done in secondary schools today. Most of the buildings illustrated were built shortly before the war according to standards approaching those laid down by the current Building Regulations. FOR the first time in the history of this country, genuine secondary education is to be provided for all children over 11. The Education Act of 1944 lays down that at this age children are to pass in future from the primary stage to "full-time education suitable to the requirements of senior pupils". Secondary education is to be the right of all, and no longer the privilege of a few. There has been some confusion about the meaning of the phrase "secondary education for all". Until 1944 a "Secondary School" meant a particular sort of school to which only a small proportion of the population could aspire, one which had better qualified and better paid staff, smaller classes, and more attractive premises and amenities than most of the other schools in its neighbourhood. It was attended by some of the ablest pupils selected by a highly competitive examination, and by a certain number of other pupils of varying abilities whose parents could afford to pay fees. This sort of secondary school will still remain, doing its own special job, and it will be at the service of all children for whom its educational provision is considered to be the most suitable. But it is now only one type of secondary school, to which pupils with particular leanings and aptitudes will go. In future there will be various types of secondary schools and various courses within secondary schools, which will offer children an education specially suited to their particular needs. All these schools will have the advantages and the amenities hitherto exclusively associated with the limited number of schools called secondary schools up to 1944. They will have equally good buildings. They will enjoy the same holidays and play the same games. There will eventually be boarding facilities for all types of secondary schools. In all these schools the studies will be related to the abilities and aptitudes of the pupils. The maximum size of classes will be the same for all. As a mere matter of finance it will, broadly speaking, cost as much to build, equip and staff one type of secondary school as another, and the jibe that the new types of secondary school have been advocated because they are cheap should be heard no more. hand all at once. It must be frankly stated that in some places the newer types of secondary school do not yet exist at all, while in the country as a whole very few of them have adequate and suitable premises. Permanent new buildings cannot be put up yet in large numbers, and for a time most of the schools will have to be housed in older buildings with such extra accommodation as prefabricated huts will afford. In most secondary schools, too, owing to the present shortage of teachers and accommodation, the classes are still a good deal larger than the maximum laid down in the Regulations made by the Minister under the 1944 Act. But the plan for the future is established, and it will be carried out. The new conception of Secondary Education will make a revolutionary change in education in England and Wales. This pamphlet has two main purposes. Firstly, it is intended to offer guidance, of a rather more detailed and concrete kind than has so far been given, to local education authorities and teachers concerning the ways in which the Minister considers that the various needs of children of secondary school age may best be met. Secondly, it is hoped that the pamphlet may help members of the public, and particularly parents, to understand the general purpose of the new plans, what the newer types of secondary school will be like, and what will be their special aims. SIDE by side with the schools that until 1944 were alone called secondary schools there were, in the public system of education, other schools for adolescent boys and girls that lay outside the elementary school system. These were the junior technical, commercial and art schools. The "secondary" schools provided in 1938 for less than one in eight, and the other schools mentioned above for less than one in 200, of the total number of children between 11 and 14. All other children, except those attending independent schools, received the whole of their education in elementary schools. schools, however, sometimes known as central schools, were set up by a number of authorities; those in London dated from 1911. The Education Act of 1918 encouraged the tendency to experiment in post-primary education by requiring authorities to provide "courses of advanced instruction for the older or more intelligent children in attendance" at elementary schools, "including children who stay at such schools beyond the age of 14". One result was the provision in certain parts of the country of "senior schools" to which all children from the other elementary schools of the district went on reaching the age of 11. Some progressive authorities reorganised whole districts in their areas along these lines, and set up a number of thoroughly successful senior schools. In 1925 the number of children in "advanced courses" of one kind or another amounted to one in every 18 children over 11 attending elementary schools. (d) that the compulsory school-leaving age should be raised to 15. For the next 13 years, under the inspiration of this report, and with the strong backing of the Board of Education, most authorities in the country set seriously to work to provide adequate facilities for the children over 11 in their elementary schools. More central schools and senior schools were built, and in several districts a fairly complete system was in operation before the outbreak of war put a stop to these developments in 1939. *"The Education of the Adolescent", Report of the Consultative Committee. H.M.S.O., price 2s. † "A second stage should then begin, and this stage ... should, as far as possible, be regarded as a single whole, within which there will be a variety of types of education, but which will generally be controlled by the common aim of providing for the needs of children who are entering and passing through the stage of adolescence." Hadow Report, page 173.
the premises of the voluntary schools, in which a quarter of the children of secondary school age are educated, suitable for the requirements of their pupils, and the managers of the schools rarely had the resources to meet the cost themselves. Such reorganisation as could be effected in existing buildings by a "reshuffle" of the children was at best only very partially successful in realising the ideals of the Hadow Report. A serious obstacle also was the fact that the new senior schools still ranked as elementary schools for such purposes as size of classes, staffing, salaries, equipment and book supply. Furthermore, the school-leaving age remained at 14 and, since many children did not pass on from the junior school till they were nearly 12, the senior schools not only could not count on the four-year course envisaged by the Hadow Committee, but had often to be satisfied with a course of barely two years or two years and a few months. In spite of these drawbacks, the senior schools of the last few years have done gallant work, sometimes triumphing over immense difficulties, and the best of them have pointed the way to the newer secondary school of the future. Some of the buildings, too, erected just before the war exemplify the standards that have now been accepted as normal for future secondary school buildings. But there are not many of these. 1. Secondary education must be made available, without cost to the parent, for every child over 11. 2. From April 1st, 1947, school attendance is compulsory up to 15 and, as soon as the Minister is satisfied that it is practicable, to 16. 3. Secondary schools must be separate from primary schools (except for schools specially provided for children suffering from some mental or physical disability). education authorities (county schools) and to the voluntary schools initially provided by a religious denomination or school foundation - in respect of which the authority pays all the educational costs, including the teachers' salaries, and in some cases is now responsible for improvements. 5. Public money is made available under certain conditions to the voluntary schools to help them to fulfil the Minister's requirements and play their part in the new scheme. 6. Every local education authority is now responsible throughout its own area for the full range of education - primary, secondary and "further" education. Previously there were some authorities responsible for elementary schools only, the secondary schools in the same area being administered by a different authority. These changes will amount to the creation, for the majority of children, of a completely new educational service. Large numbers of new teachers will have to be trained, and in most areas new schools will have to be built, to enable this new service to be provided. Obviously all this will take time. To carry out an operation of this size, apart from present shortages of labour and materials, it is essential that the planning should be well and thoroughly done, so that the new schools, when they are built, are in the right places, of the right size, and organised to suit the various needs of r.he children. This long-term planning is going well ahead, and in the meantime a great deal is being done to meet immediate needs. New schools are being built where, for instance, new housing estates make them urgent, and some thousands of temporary but well-equipped buildings are being added to schools all over the country to accommodate the children who will stay another year at school from now onwards. Emergency training colleges have been set up for men and women who have been engaged on national service; these are already helping to provide the increased number of teachers that will be needed, while the output of the ordinary training colleges and universities is being expanded. To show just how the long-term planning is being tackled it may be useful to give here some account of the "Development Plan" which every local education authority was required by the 1944 Act to produce. Clearly, if the intentions of the Act are to be fulfilled, the administrative machinery of the local and central authorities will have to be geared to school planning and construction on a really large scale. The development plan, based on the authority's estimate of the immediate and prospective needs of the area, has to show in detail what the authority propose to do in the way of building new primary and secondary schools or improving old ones in order to meet the requirements of the Act and of the Minister's Regulations. The voluntary schools must, of course, be included in the picture, and this may mean detailed negotiations with many separate bodies of Governors and Managers. The size and type of each school has to be indicated, in relation to any probable changes in the population. The plan also has to state what arrangements will be made if necessary for transporting children to and from school, whether a school will be co-educational or not, and so on. And it must specify the stages and times by which the authority propose to put it into operation. In fact, the development plan has to give a complete picture of the future lay-out and organisation of primary and secondary education in the area of the county or county borough. The needs of different areas will naturally differ, and there is scope for wide variety in these plans within the framework laid down in the Act. The authorities were given a year from April 1st, 1945, in which to prepare and submit their plans to the Minister, who was, however, given discretion to allow longer in case of need. There are, for instance, areas where large-scale rehousing is to be carried out, and where the sizes and sites of schools are bound to remain uncertain until the housing plans are settled. The development plans are scrutinised by the Minister, who may call for modifications in them and must consider any objections; received from individuals or interested bodies. When approval has been given to the plan, a "Local Education Order" is made for the area. This order can specify how and when the various stages of the plan are to be carried out. Anything the order contains has the force of law, and is binding on the authority, which has, however, the right to appeal to Parliament against the order or any amendment of it. It will be seen that this machinery, though apparently complicated, does ensure that the preliminary planning is careful and thorough, and gives the Minister the opportunity to secure that the intentions of the Act are effectively carried out over the country as a whole. It also gives the Government the necessary information on which to estimate the total needs of the country, so that directly the new school building programme can be begun on a large scale, adequate materials and labour can be ensured the necessary priority as part of the national building programme. DIFFERENT types of secondary education will be needed to meet the differences that exist between children, and something will be said of these differences later. But it is important to emphasise that there are a great many features that must be common to all types of secondary education in the future. On the material side, the Minister has issued a common code of Building Regulations that lay down the same minimum standards for all secondary schools. Subject to necessary differences due to variations in curriculum and in the age range of the pupils, the requirements are identical for every type of secondary school. The Regulations* specify, for instance, the minimum number and size of classrooms for schools of different sizes. Every secondary school must have an assembly hall, a gymnasium (these may be combined in the case of very small schools), a library, an art and crafts room, rooms for other practical activities, and a dining-room. The gymnasium must be properly equipped, and there must be rooms for changing and shower baths. There must be a large level playground, and playing-fields must be provided, either on the school site or in a reasonably accessible situation. Nor is there any distinction made between the different kinds of secondary school in the other general requirements laid down by the Minister. There is a common maximum of 30 pupils in a class. The conditions governing approval by the Minister as a "qualified" teacher are comprehensive and do not differentiate between the various types of school. A common scale of salaries, recommended by the national negotiating body (the Burnham Committee), is binding on all employing bodies. Maintenance allowances, too, may be paid to pupils over compulsory school age in any type of school maintained by local education authorities, and authorities have been asked† so to frame their scales of award that parents, especially those within the lower income ranges, are not obliged to withdraw a child before the end of his school course because they cannot meet the expense of keeping him at school beyond the normal leaving age. 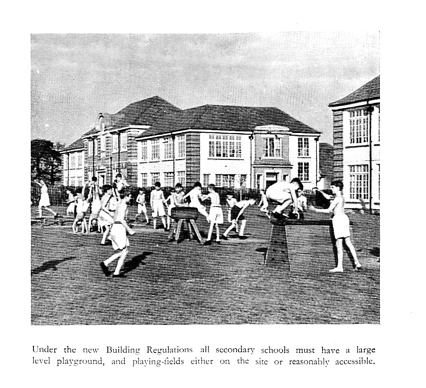 *Regulations Prescribing Standards for School Premises, 1945. H.M.S.O., price 6d. ; Memorandum on the Building Regulations. H.M.S.O., price 6d. †See Ministry of Education Circular 26. H.M.S.O., price 1d. All these, which relate equally to all schools, whether county or voluntary, "maintained" by a local education authority, are administrative provisions. But some common educational features arise directly out of the requirements of the Building Regulations or out of the common use of up-to-date items of equipment whose provision is urged in the memorandum that accompanied those Regulations. The requirement that all secondary schools are to have adequate library provision will enable them to ensure that all their pupils learn the proper use of a library. Library periods should be arranged for each form, and great care taken to train every pupil to find his way about a library, to become accustomed to using books both for entertainment and for information, and to form the habit of using the public library service to supplement the school library. Up-to-date equipment and the new teaching media that have become available through the swift advances of science in recent years will be used by all types of secondary schools. Books, maps, diagrams and pictures have for centuries been part of the accepted equipment of teachers; modern invention has put a whole range of new technical resources at their disposal. The blackboard is still a remarkably versatile and valuable piece of teaching equipment, but there are other "visual aids" which any secondary school will soon regard as equally indispensable. The cine-projector is at last coming into its own for school use, and steps are being taken to co-ordinate and stimulate the production of suitable films in adequate quantity and variety. A film-strip projector, a simple, cheap and effective substitute for the old magic-lantern, will soon be in the possession of every school. The pictures to be shown are printed on a small roll of ordinary film stock so that quite a large number of photographs can easily be carried in the pocket. With comparatively simple equipment any teacher will be able to make up his own film strips. 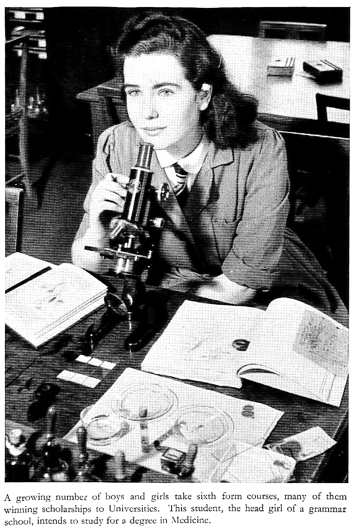 Micro-projectors (which project a magnified image of an object), stereoscopes, episcopes and perhaps soon television offer a further choice of techniques which the teacher can use by themselves or often with advantage in combination. All these visual aids, if wisely used, extend the range of what the teacher can do. They help to express ideas more exactly and clearly; they can give a new reality and vividness to history and geography; and they can enrich a child's imagination by bringing him into contact with the world's great art. Something like what the projector can do for the eye, broadcasting and the gramophone can do for the ear. Broadcast lessons have been taken in schools for several years past and their value is widely recognised. They can bring the voice and experience of the expert and the eye-witness into the school, and they can make things that seem comparatively dull to read about live in a dramatic presentation. Broadcasts of a more general type give children an almost first-hand apprehension of current events of national importance. The radio and the gramophone both offer contact with the world's great music. There are also many educational features that will be common to all secondary schools because the schools will have resemblances that result from common purposes. In every secondary school attention must be paid not only to the intellectual, but also to the social, emotional, physical and spiritual growth of the child. The individual pupil needs to develop as a member of a community and he must learn to live with other people. The secondary school can make a deliberate effort to include as a leading feature of its syllabuses and training a study of what has come to be known as "Citizenship" or "Civics", that is, the basic information about local and national government, rates and taxes, the judicial system, and so on. It can lead the pupil to a wider conception of his status and responsibilities as a citizen of this country and of the relation between this country and the British Commonwealth and the United Nations. The school can offer him the experience of school elections and of school councils with representative responsibilities. It can establish an "Information Room" and a reference library. All this will in itself help to fit the pupil to play his part in society when he grows up. But the school can do more than this in giving him a background against which he can "practise civics". The staff will, of course, set him an example by the way in which they behave to one another and to their pupils, and they can encourage him in his turn to treat others with courtesy and consideration, to be sensitive to the feelings of others and to respect their points of view. In a co-educational school (and many secondary schools in this country are and will be co-educational) boys and girls will have plenty of opportunities of learning how to get on with one another. the possibility of experience in committee work and procedure and in the discussion of practical difficulties and problems with objectivity and tolerance. Many of these clubs will doubtless meet out of school hours. Some of them will take their members right away from the school premises. For the child who lives in a large town, particularly, the school journey or club expedition is much more than a trip: it may be a revelation of an outside world of which he has only read in books. It would take too long to enumerate all the clubs formed and activities undertaken by schools in town or country. These range from a reassembly of club members after the end of the afternoon school for activities of all kinds, such as physical work, gardening, acting plays, carpentry, drawing and painting, or quiet occupations such as indoor games or reading, to actual clubs, such as Young Farmers' Clubs, clubs for photography, science, rabbit-keeping and the like. The value of such clubs goes far beyond the accomplishments learnt by the members; they show many a child who learns with difficulty or does not take kindly to schooling that his teachers are ready to help him with things he likes doing and to take trouble with him. Their effect on his attitude to school and to society is great, and they provide a powerful means of preventing and combating juvenile delinquency. Their importance will certainly come to be more widely realised than at present. The presence of large numbers of boys and girls who stay for dinner and remain at school for the midday interval provides an opportunity for individual, group and communal activities which is already being grasped in many schools. It is sometimes urged that the schools give children too much responsibility and lay too heavy a burden on them. But the opposite danger of not giving them enough is probably much commoner. To be given something to do and to be expected to do it - that is a responsibility that can and should be given to pupils at many points in the work and in the play of a school. Responsibility for the decoration of a table or a room, for looking after the library, for collecting information, for choosing what is to be done next, offers them, if wisely given, an excellent opportunity of learning about the community of which they are members by sharing in its work and organisation. The older pupils, too, should be allowed some recognised part in the running of the school and in seeing that its buildings and grounds are well kept. Many more opportunities arise for social training of this kind in boarding-schools than in day schools, and this is one of the main reasons why it is greatly to be hoped that local education authorities will experiment with residential secondary schools of all types. healthy social life. Every pupil must be encouraged to form sound personal and social relationships. Through a school's normal day-today activities, whether in or out of school time, there must run a strong sense that it is a body of people living together, helping and learning from one another. This sense of corporate life is cemented by the daily collective act of worship, by the special functions of speech day or school concert, by school games, school meals, societies, expeditions, camps, and by any other activity that involves the co-operation of every member of the school community or any section of it intent on the pursuit together of their special interests. It is now fairly generally acknowledged that impulses with their accompanying emotions ought to be expressed and not repressed. This does not mean that it does nor matter how they are expressed. It is important that they should be expressed in a way that is at any rate harmless to society and, if possible, actually beneficial. It is obviously preferable that the aggressive impulses should be expressed in the form of dogged perseverance rather than in the form of assault and battery. Much will, of course, depend, in the early stages of this process, on the home; but the school also has its part to play in providing legitimate outlets for impulses and emotions and so getting them into some kind of order. Man has always used the arts as a means both of expressing and of disciplining or ordering his feelings, and recent experience in school and clinic has shown that they have not lost their beneficent influence. The part of the school curriculum that is most obviously concerned with this aspect of education includes, of course, art, music, drama, dance and craft-work in the broadest sense of the term. In these activities the pupils share a real emotional experience. all secondary schools implies a systematic training for all pupils under specially qualified teachers. Where suitable facilities exist, swimming is also included. Boxing and wrestling are keenly followed where there are masters on the staff competent to teach them. Games equipment is provided by the local education authorities, who are also empowered to purchase the appropriate clothing and footwear for all activities normally included in the physical education scheme. Regular medical and dental inspections of pupils at secondary schools are no new features; both have their important contribution to make to the children's physical development. The vast extension, too, of the school meals programme in the last few years and the acceptance by the Government of the principle of meals without payment for all day-school pupils, which will he given full effect as soon as the necessary premises and equipment can be provided, will certainly have a direct influence on the physical well-being and social training of the school population. Milk is already available without cost to the parent. And the staff of a school have their part to play. The children's food and how they eat it, their posture, their quality of movement, the ventilation of the classrooms, and many other points connected with health and hygiene, are the concern of every member of the staff. The child of to-day has not generally the same experience of a close association with nature that gave his ancestors some kind of immediate apprehension of great laws and invisible forces behind the phenomena that they witnessed. For many children, too, the great Christian festivals have not the same significance that they had a hundred years ago. But there are many ways in which a child's spiritual development can be fostered and the school should make the most of them. It can establish a moral tone that ensures th.at every pupil is in constant contact with people, both adult and adolescent, who are fired by generous ideals and set an example of creative and unselfish living. Young people respond quickly to example, and the school is a community where standards of good manners and helpful and courteous behaviour can be achieved that will have a lasting influence. constantly accessible. It can be found not only in landscape, bur also in the form of a leaf or flower, in the colour and texture of bark, in the light on a fish turning in a bowl, in a bunch of grasses, or in a fir-cone. Plenty of such things should always be available to look at and enjoy casually, silently, almost unconsciously. And it may be urged that the greatest source of satisfaction is to be found not in nature's beautiful moments but in her processes, which can arouse a deep spiritual satisfaction, a sense of the wonder and the universality of life that can be obtained in no other way. But for many the supreme spiritual values are religious, and every boy and girl whose parents do not forbid it will be made aware of the religious interpretation of life. The 1944 Act requires* that "the school day in every county school and in every voluntary school shall begin with collective worship on the part of all pupils† in attendance at the school", and that "religious instruction shall be given in every county school and in every voluntary school". Moreover, the influence of religion, in the widest sense, need not and should not be confined to the periods set apart in the time-table for specifically religious instruction. On the more strictly intellectual side, training in clear thinking and expression is one of the basic demands that must be made of any secondary school. It is not a demand that can be met by the provision of a few periods set aside for lessons in English grammar or in logic, divorced from the subject-matter dealt with in other lessons. The obligation to develop clarity in thought and expression lies on every teacher. There is much truth in the saying, "Every teacher is a teacher of English". It is one of the central aims of every school, and particularly of every secondary school, to ensure that its pupils attain the power to express themselves clearly and intelligibly in speech and in writing. In Wales these tasks may be complicated by bilingual factors, which will require special consideration if these objects are to be attained. †Except those withdrawn under the provision of Section 25 (4), which safeguards the rights of a parent who requests that his child may be excused from attendance at religious worship or religious instruction. worthy, the children should leave school with a desire to follow them further and to develop fresh pursuits. This does not mean that children should be allowed to do just what they like - that they should never be faced with an uncongenial task and made to see it through to a finish. Interest should be an incentive to solid work, not a substitute for it. And the children's interests must be met, not merely piecemeal, but through a systematic and progressive course. The teacher's job is to ensure that a childish bent turns into a serious pursuit presenting its own challenge to hard work and its own difficulties to be surmounted; no real education is come by easily. If a child sees a recognisable purpose in his activity he will work hard at it. The eager, patient way in which a child pursues a hobby - the intensive study of stamps or birds, of film stars or aeroplanes - shows how well he concentrates when his attention is caught. Whatever type of curriculum the school offers, something of this spirit of adventure must be evoked by the teacher of the humanities, housecraft, games, languages, or whatever may be the business in hand. Children who are educated through their interests, who have acquired a sense of mastery in some direction, who feel that the school is in touch with the world in which they live, welcome the opportunity of working out their ideas and developing their skills, and will develop initiative and character in the process. This applies with special force to those who are now to have a longer time in which to make the most of school life. Experience shows that boys and girls who are thoroughly interested will be eager to carry on their "school" activities out of school hours, in such ways as collecting and tabulating information, drawing diagrams and making things. There is little doubt that this is the most profitable kind of "home-work", since not only is it done with enthusiasm, but it emphasises the value of the activities themselves. Only a part of a child's education is given by the school. A pupil at a day school - and the majority of schools will be day schools - spends a comparatively small proportion of his time at school. Even a pupil at a boarding-school will pass nearly a quarter of the year at home. The school will, therefore, in a sense, supplement the education of the home and of the world outside. The success of any school depends, to an extent not always recognised, on its appreciation of what the children do in their spare time. It is unlikely to retain the respect and zest of its pupils if it fails in its outlook to keep abreast of social and scientific changes which inevitably influence their lives and stimulate their imaginations. in spite of pioneer work by many heads - being recognised as of great importance. A headmaster is supposed to have once cried out in his wrath, "No parent is fit to have children", but the attitude which this natural but illogical remark represents is almost a thing of the past. It is very desirable that parents should be interested in and know something about the day-to-day work of the schools. Home and school are partners in the educational process. It is recognised on all sides that associations of parents and teachers may be of great help to a school in enlisting the parents' co-operation and interest, and in giving them a fuller understanding of a school's aims. In the past it was common, especially in poor districts, to find real hostility between parents and the school; yet examples could be quoted of outstandingly successful parents' associations in just the districts in which such hostility might have been expected to exist. Associations have flourished in the slums of large cities and have included large numbers of fathers as well as mothers, and have succeeded not only in bringing parents and teachers together in regular gatherings, for lectures, talks, concerts and entertainments, but in securing help for the schools in a thousand and one ways. No less than the schools, they have been an educative force for the neighbourhood. Undoubtedly the value of such co-operation will be increasingly recognised, and schools which still hold aloof from admitting the parents to too large an insight into their secrets will come to realise that their attitude is out of date and that they are wilfully forgoing what could be a great source of strength. of the sort of person he is, something that an employer can accept with confidence, and that will genuinely help the boy or girl to get a suitable post. EVERYONE knows that no two children are alike. Schools must be different, too, or the Education Act of 1944 will not achieve success. They must differ in what they teach and how they teach it, just as pupils differ in tastes and abilities. The secondary school system must consequently offer variety in the curriculum and variety in the approach, suited to the differing aptitudes and abilities and stages of development of the children concerned. * Moreover, for many years to come the school life of some children will be longer than that of others. Pupils who hope to go on to the university, for example, will naturally remain at school longer than those who aim at being apprenticed at 15 or 16. Secondary courses for some pupils will thus have to be planned to cover six to seven years, while other pupils will need courses of four or even (until the leaving age is raised to 16) of three years. 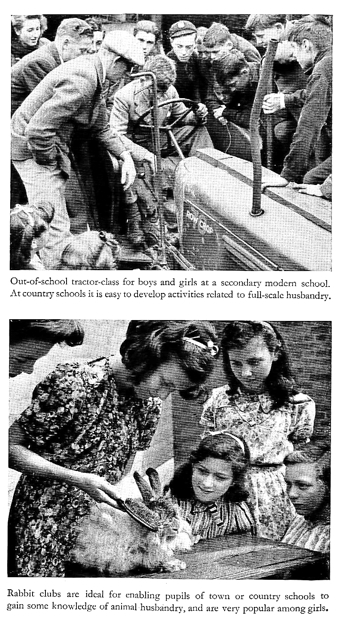 The importance of these factors is recognised in the 1944 Act, which requires secondary schools to be "sufficient in number, character and equipment to afford for all pupils opportunities of education offering such variety of instruction and training as may be desirable in view of their different ages, abilities and aptitudes, and of the different periods for which they may be expected to remain at school".† Clearly there must be wide variety in the secondary system. The curriculum must be made to fit the child, and not the child the curriculum. The schools must offer individual children who differ widely from one another the kinds of curriculum that will fit them all to live happily and to become useful members of the community. easily by dealing with concrete things and following a course rooted in their own day-to-day experience. At the age of 11 few of them will have disclosed particular interests and aptitudes well enough marked for them to require any other course. The majority will do best in a school which provides a good all-round education in an atmosphere which enables them to develop freely along their own lines. Such a school will give them a chance to sample a variety of "subjects" and skills and to pursue those which attract them most. It is for this majority that the secondary modern school will cater. Some children, on the other hand, will have decided at quite an early stage to make their careers in branches of industry or agriculture requiring a special kind of aptitude in science or mathematics. Others may need a course, longer and more specialised than that provided in the modern school, with a particular emphasis on commercial subjects or art. All these boys and girls will find their best outlet in the secondary technical school. Finally, there will be a proportion whose ability and aptitude require the kind of course with the emphasis on books and ideas that is provided at a secondary grammar school. They are attracted by the abstract approach to learning and should normally be prepared to stay at school long enough to benefit from the "sixth form" work which is the most characteristic feature of the grammar school. Both "books" and "activities" are essentials in all the three types of secondary school; no school can afford to base its work exclusively on one or the other. The person who has no kind of skill with his hands is as imperfectly prepared for life as one who cannot read. The proportions in which these two ways of learning are to be combined should be determined by the capacities and needs of the individual pupil, and the basic principle is that whatever his native ability a child must be guided towards the kind of work in school over which he can acquire some sense of mastery. This means, for instance, that it is of little use to present subject-matter to him which he is unable to appreciate or to press him to labour in an atmosphere of frustration. It will be evident that it is as unfair to the child to expect him to develop through a study of Latin or advanced mathematics, if he shows no sign of attaining any standard in them, as it is to restrict him to a practical or scientific approach if his more characteristic outlet is through the humanities. No organisation, indeed, will adequately meet the situation that involves the sacrifice of the best interests of one type of child to those of others. This is a sacrifice our country cannot afford. desires to lay down no set guides for organisation but to encourage local authorities to plan as best suits their local needs. In some places where conditions are favourable the best way of carrying out the new plan may be to combine two, or three, types of secondary education in one school. Current controversy on this subject has shown the disadvantages, as well as the obvious advantages, in such an organisation. Where it is adopted it will be particularly necessary to ensure that the courses provided are sufficiently varied to meet all needs and are of equal status, that transfer from one course to another is facilitated, and that opportunity is given to all children, the less able as well as the abler, to develop fully and to gain some experience of responsibility. In order to ensure that a school providing secondary education for all the senior children in a given area offers proper scope and opportunity for all its pupils, it will have to be a very large school. It is doubtful whether a school with less than a ten-form or eleven-form entry (that is a total of 1,500 to 1,700 pupils) is capable of offering the necessary variety of suitable courses. There is much to be said for what is sometimes called the "campus plan". In this, a number of schools varying in character and tradition are built on a single large site, and make common use of many facilities and amenities, such as playing-fields, swimming-baths and dining-halls. They constitute a kind of federation of schools, each one developing its own individual character, yet each making its contribution to the life of the larger unit. There is, indeed, no end to the possible varieties of organisation; the system must be flexible and experiments of many kinds are to be welcomed. The only proviso that must always be observed is that the real interests of the children must come first. Whatever type of organisation is adopted and however careful and thorough the methods of allocation at 11 may be, there are likely to be some misfits. For a few pupils it may turn out that a wrong choice of secondary course was made at 11. A few others may develop aptitudes in the first year or two at a secondary school that were dormant and unsuspected earlier. To meet the needs of such pupils all local education authorities must have arrangements which make it possible without difficulty to transfer them at any stage in their secondary school career from one type of secondary education to another. The way must be clear for boys and girls in any type of secondary school to continue their education in such ways as will give them the opportunity to go on to higher studies at a university, college of further education, or elsewhere. should be kept clearly in mind, the preceding chapter illustrates the need to avoid exaggerating and stereotyping the differences between types of education that have and must always have a great measure of common ground. Whether education is offered in separate grammar, technical and modern schools, or in schools that combine two or more of these types, it must contain as essential ingredients such common features as have been described, it must appeal to the interests of the pupils and it must be related to their ability. It must provide them with the best possible conditions for growing up, for reaching the appropriate stage in the maturing process so that they may leave school as balanced individuals ready socially, emotionally, physically, spiritually and intellectually for the next stage in their lives. THE only schools that were known as secondary schools before the passing of the Education Act of 1944 are those now called grammar schools. The particular varieties of education they offer will in future be only a small part of the whole field of secondary education. Their long history and the standards they have already achieved help to give them a sense of direction and there is comparatively little that need be said about them in this pamphlet. It is convenient therefore to consider them before going on to deal, more fully, with the newer types of secondary education. The grammar school offers a general course lasting for about five years in which the treatment of all subjects and groups of subjects, but notably languages (classical and modern), mathematics and science, follows a predominantly logical development, and a subsequent intensive course in the "sixth form" covering a narrower range of subjects, which for many boys and girls leads naturally on to studies at the university level. The distinguishing feature of both courses lies not so much, perhaps, in their content as in their length, in the scholarly treatment of their content, and in the stern intellectual discipline that they afford. intelligence, they must be fond of books and readily drawn to abstract ideas, and they must be prepared to stay at school long enough to derive real benefit from the studies they will undertake. Some consideration of the qualities necessary to the grammar school pupil will be found in the Norwood Report,* to which those interested are referred. Within the range of talents and interests manifested by such pupils, the grammar school will find scope for the many-sidedness on which in the past it has set high value. Though the effects of the Education Act are likely to be more striking in the fields of technical and modern school education, it would be a mistake to suppose that this Act will have no influence on grammar school education. The new regulations prescribing standards in the buildings of secondary schools of all types will enable grammar schools in the future to have more suitable and more comfortable accommodation for their manifold activities than many of them have had in the past. Admittedly, the immediate needs of primary schools and of the newer types of secondary schools are likely to be more urgent than those of grammar schools, and therefore it is only reasonable that these more pressing needs should be met first when all cannot be met at the same time. But the standards of the Building Regulations remain as a goal as much for the grammar school as for any other kind of school. Another effect of the Act is the probability that grammar schools in the future will be enabled to concentrate more fully than they have done in recent years on their proper function. Now that there are to be other types of secondary schools specially designed to provide for pupils whose aptitudes require a different kind of approach, there should be no need for the grammar school to go on organising modified courses and adapting its curriculum to meet the requirements of pupils for whom its own form of education is not really appropriate. themselves. For there are tasks which await them within their own boundaries - tasks that call for imagination and courage and faith as well as for thought. For some years past there has been a growing tendency for grammar school pupils to stay on at school to reap the benefits of advanced work, and there has been a growing belief that the grammar school course is incomplete if it ends at 16 and lacks two years' experience of the methods and objectives of further study. This belief is likely to be more firmly held and more vigorously expressed when the compulsory school age is raised. Eventually it will become a commonplace. This means that the grammar school course is coming to be regarded as a single whole from 11 to 18, the earlier part of which should lead naturally on to the later part and should no longer be conceived as a course complete in itself to which a few pupils add an extra period of one or two years. Admittedly this change has not yet taken place, and it will probably take some years to reach its full effect. But the tendency has declared itself clearly enough to invite headmasters and headmistresses to make plans for a "course" of six or seven years' duration, to envisage it as a unity, and to review questions of organisation and curriculum in this light. With a six or seven years' course so conceived, and with any external examinations that may be taken placed at the point in the course at which their purposes are seen to be relevant, many of the difficulties that now beset the curriculum would be removed. Far greater flexibility would result. At present a number of subjects are taken for four or five years with much the same degree of intensity, and it has generally been thought that a continuous course is essential in most subjects. Beyond this stage the work has become more and more specialised, and this period of specialisation has become prolonged. Pictorially represented, a tall and narrow pillar of advanced work stands upon a broad and low base of general studies. The pillar has tended to become longer and narrower, and as more subjects claim attention in the lower and middle forms the base has broadened. to the needs and aptitudes of the pupils, and the advanced work, though still advanced, would be broader in scope. Reconciliation could be brought about between the claims of specialised studies and those of wider interests. In the lower forms the valuable influence of the form master or form mistress would be more fully felt, while in the middle forms there could be less congestion if it were realised that opportunities would arise later on for taking up new studies or resuming old ones in a way suitable to the maturer years of the pupils. Consideration will have to be given, too, to the relation between work done in school and work done out of school, to the relation between "private study" and class periods, to the place of "memorisation" and of "factual" knowledge, and to many similar questions which, though familiar enough to the schools, still deserve further thought. The changes now taking place in the whole organisation of secondary education invite the grammar schools to consider and prepare for the next step in their development. They will have to maintain their own ideals, and they must work out a unified curriculum that exhibits flexibility both of content and of treatment. How this is to be done is a problem which only the schools themselves can solve. No solution imposed from outside, in ignorance of the special features of individual schools. could have any value. For this reason no more is said about it here. But there is every reason to believe that the grammar schools will grasp the opportunity which is now presented to them of reasserting their special purposes and their proper standards. In some ways they will find that they must break with the past; in others their very traditions will be their strength. At any rate, they can face the future with confidence and courage and with an added sense of responsibility. fact, very few schools of this type in this country that represent, in conditions, buildings and general curriculum, the standard which all must reach as soon as possible. Unsuitable premises, lack of stability in staffing, classes of 40 or more and the leaving age of 14 have been among the chief causes that have hampered development so far. But the general outline is clear. Perhaps the main difference between a modern school* and other types of secondary schools is its very broad outlook and objective. It has to provide a series of courses for children of widely differing ability, aptitude and social background. It has to cater for the needs of intelligent boys and girls, for those with a marked practical bent, as well as for the special problem of the backward children. To quote the Spens Report: "By no means all who succeed in commerce or industry are the type which benefits at all obviously from an academic and scientific education, and it is very probable that many such men would have gained more from the curriculum of a modern school, especially if, as might well have been the case, they were more attracted by such a curriculum and more industrious in pursuing it".† On the other hand, the Ministry's recent pamphlet on Special Educational Treatment makes it clear‡ that a number of educationally subnormal children will be attending modern schools. With such a wide variety of ability the modern school must be free to work out its own syllabuses and methods. Teachers must constantly be ready to ask themselves "Why? ", "When? ", "Where? ", "How?" and "What? ", and be free to act on the answers. And since neither teachers nor teaching conditions nor children are mass-produced to a uniform pattern, the answers to these questions will vary not only from school to school, but, even more widely, within a school. *Here and in what follows the term "modern school" is to he understood as covering the modern streams in bilateral and multilateral schools. †Report of the Consultative Committee on Secondary Education with special reference to Grammar Schools and Technical High Schools (1938), page xxxiv, H.M.S.O. To be reprinted shortly. ‡Ministry of Education Pamphlet No. 5, pages 23 and 25. H.M.S.O., price 9d. to do a job properly and thoroughly and not to be satisfied with bad workmanship, and to be exact in what he says and does. Freedom and flexibility are of its essence and are indeed its great opportunity. The best existing modern schools already offer convincing examples of the lines on which this general objective can be attained. They are providing a broad and balanced general curriculum, and they are giving it reality by means of many kinds of practical activity. They are achieving, on the one hand, a standard of effort and performance that is raising the common estimate of the capacities of the children attending them, and, on the other, they are showing themselves as much concerned, and not less successful, in dealing with the needs of the more backward pupils. The modern school will be given parity of conditions with other types of secondary school; parity of esteem it must achieve by its own efforts. Local education authorities can help to hasten this development in several ways. They can show in their public policy that they have faith in the modern school; they can treat it with the same trust and confidence as they treat the grammar school and administer both with a loose rein that allows plenty of scope to the heads and their staffs. They can staff the schools liberally, so as to allow of the subdivision of forms and some free time for the staff for preparation and marking of work. They can give modern school heads the same measure of responsibility in the appointment and retention of their assistant staff as is commonly enjoyed by grammar school heads. They can give stability to the modern school staff, so that its members can feel that they are genuinely members of a team and not merely so many individual teaching units liable to be moved from school to school. They can encourage generous expenditure on books and equipment. They can advertise the schools' secondary status by such apparently trivial acts as the provision of school uniforms, caps and blazers. And they can establish residential modern schools. wide knowledge and experience of life with a readiness to experiment and to adapt their methods to the ever-varying needs of the pupils with whom they have to deal. They will be free to plan the curriculum of the school on purely educational lines, to provide their pupils with the best possible conditions for growing up, and to ensure that they leave school with interests thoroughly aroused and a determination to continue their education throughout their lives. The education of children is not like the culture of organisms in a test-tube. The children are brought up in a certain environment and most of them are being prepared for life in it. All schools, therefore, are bound to take colour from their surroundings and to use them, where possible, to enrich the liberal education that they give. The modern school will be no exception to this rule. Though no two modern schools will be exactly alike, it is possible to describe in broad outline the general principles on which all will work and to indicate some of the ways in which these principles are applied to practical problems. The rapid industrialisation of the last century has brought with it many material benefits to the people of this country, and the ordinary citizen's standard of living has certainly risen greatly since the Chartists gathered on Kennington Common in 1848. But it will be generally agreed that, for the town-dweller in particular, something has been lost in the process - something of the pleasure and good standards achieved by the craftsman, something of directness and simplicity, some of the sense of the closeness to nature of the village and some of the sense of community with other people of the small town. If this is so, it must be the job of education to try to give back to him in a new setting some of the good things he has lost. For this the schools must concentrate attention on securing a balanced and harmonious development in which there is not an undue emphasis on intellectual growth, but in which intellectual growth is seen simply as one facet of the whole child. The child's social, emotional, physical and spiritual development demands equally serious consideration. Something has been said in an earlier chapter of the ways in which schools can take these aspects of education into account. No claim is made that they are the unique concern of the modern school. But the modern school of the future must go considerably further in giving scope to these sides of a child's development than schools have commonly done in the past. The various factors that contribute to social and spiritual development must play an important part. Both on the time-table and in the general life of the modern school, religion, physical education and aesthetic subjects must take a prominent place. Fathers and mothers may object at this point that, after all, a child is sent to school to learn to use his brains. So he is. But he is not sent to school to learn to use his brains and to learn nothing else. It is because fostering a child's intellectual development has often been thought to be far and away the most important function of a school, sometimes to the exclusion of almost everything else, that so much stress is laid here on other functions that are equally important. Because of the very wide range of ability in the modern school, it is on the side of intellectual training that the biggest differences will be found between the modern school and other types of secondary school. Some children in the modern school will learn easily and others very slowly. While the latter will require an extremely simple presentation of their subject-matter, the abler children will need something that they can get their teeth into, and there must be no ground for any complaint that they are "marking time" and not being given full opportunity to develop their intellectual powers. The things taught in the modern school classrooms, activity rooms, workshops and grounds are not completely separate sets of things that exist in water-tight compartments, and there is a necessary and desirable overlap between them. A lot of history, for example, will often come into a good geography lesson, and many a handicraft or gardening lesson will involve mathematics. Hard and fast lines between subjects are generally inappropriate in the modern school, and for this reason it is doubtful if, in the lower forms at any rate, any very extensive measure of "specialisation" (that is, an arrangement by which teachers concern themselves with a single subject with a number of forms) is desirable. Among the subjects that will be taught in all modern schools come English (or English and Welsh), mathematics, history, geography and science. In many schools a modern language will be taught. The "practical" subjects that will be taken include physical education, art, music, handicraft, housecraft and various kinds of craft work, and, wherever possible, gardening and animal husbandry. *Except religious instruction, which is made obligatory in every school by Section 15 (2) of the Education Act, 1944.
mistress is responsible for framing the curriculum and drawing up the syllabus of his or her own school. He may get advice and guidance - possibly criticism - from His Majesty's Inspectors, but never direction. What follows in this section is therefore in the main descriptive. It is based on the practice of good existing schools, but it does not aim at giving directions to heads in a matter that lies within their discretion. Learning to use their own language and to enjoy what is written in it is a part of the education of all children. In the past the written word has possibly had too much emphasis. More recently teachers have recognised that speech is of equal importance, and is, indeed, a necessary preface to reading and writing. Beyond these basic achievements lie the delights of literature, of speaking and reading poetry and prose aloud, of composing in prose and verse, of taking part in a play and enjoying a dramatic performance. 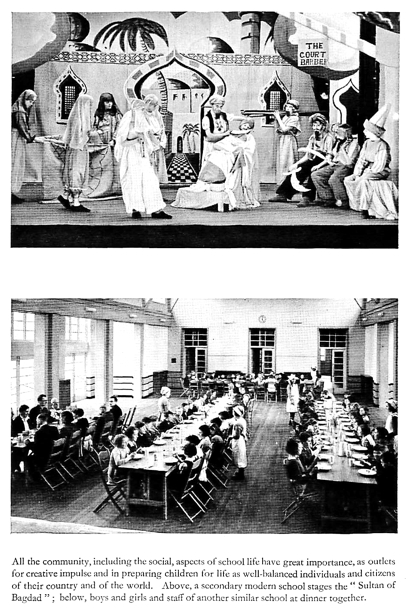 The much freer approach to the teaching of this subject is evident in the wide increase of school libraries, lively experiments in movement and drama, the beginnings of children's theatres, and the encouragement of the children's own natural outlet in words and rhythms of their own choosing. Children who have a taste for it and whose attainments in English suggest that they have some linguistic ability should have an opportunity to learn a foreign language in the modern school. For this they will require a teacher who has a good command of the colloquial language. For oral work will predominate, and the aim must be to attain the ability to use and understand a living language, not to study it as if it were a dead one. It will be important to avoid a discouraging emphasis on grammar, and the written translation of passages into the foreign language should normally have no place in the scheme. It is the ability to understand and read that will be developed, and to speak rather than to write. Consequently the teacher will make all possible use of such teaching aids as the radio, gramophone, films and pictures. A room specially equipped for modern language teaching will be helpful. So will the provision of a foreign newspaper, correspondence with boys and girls in the foreign country, exchanges of individual pupils, and carefully planned holiday visits abroad. The claims of a foreign language, where it is taken, to something like a period a day throughout the school course will be justified in schools where a group of pupils show a clearly marked interest and the teacher succeeds in firing their enthusiasm. history, with some understanding of current affairs. The broad purpose of the study of history and geography in the modern school will be to give a sense of continuity of growth and of the variety of human achievement, both material and spiritual. Much has been done of recent years to enliven the approach to the past and to give it present meaning, and to link history with geography, by means of surveys of the surroundings of the school and of the neighbourhood. These surveys can be made not only in places of historic interest, but in new suburban and old industrial areas. There has been, too, a great development in visits to museums and places of historic and geological interest, and these visits, if well planned and adequately followed up, are very valuable. It is now much easier than it has been in the past to collect historical and geographical material; much stimulating material about the Dominions and Colonies has been made available freely to schools. The use of the cine and film-strip projector and of the radio and the keeping of weather records should play a growing part in the teaching. In the new schools, with their separate geography and history rooms, these subjects should make a real appeal to the children. lead to simple trigonometry and be accompanied by the use of logarithms. The course in science should be designed to give pupils some understanding of the laws of nature and some grasp of the scientific achievements of man. In doing so it will inevitably arouse their wonder and stimulate their curiosity. If it is successfully worked out, it will encourage a scientific attitude of mind. Probably the most effective way to secure these ends in a modern school is the adoption of an integrated syllabus of "general science" that combines in a coherent scheme a wide variety of studies covering the whole field of natural science. Biological studies, as well as those dealing with the inanimate world, should be included in all schools. Topics for study should be selected for their intrinsic importance and interest and not because they fall within certain conventional branches of the subject. The actual selection will, no doubt, vary to some extent from school to school. In rural areas there is likely to be a somewhat greater emphasis on biological studies, while city schools may pay greater attention to the physical sciences. However, in neither type should attention be too much concentrated upon one branch. A knowledge of biological principles is essential for town children, and an urban environment does not present serious difficulties to their study. And the physical sciences are of fundamental importance and should be included in the course of rural schools - if only on account of the growing electrification and general mechanisation of agriculture. 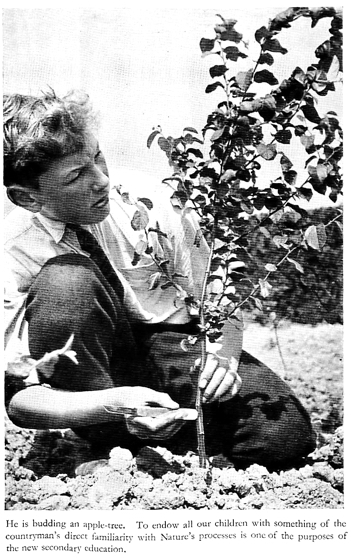 Gardening and the keeping of animals are by no means limited to rural schools, though here they will be developed most fully. Weather science is of interest to everyone, and even in the midst of the densest cities the ever-changing panorama of the sky is available for all to study. From it much can be learnt about many fundamental physical principles. Surveys of local industries and of the processes employed in each are valuable, and here the urban school has possibly an advantage. In all these and in many other ways the child may be given some understanding of the universe in which he lives, of the phenomena that occur in it and of the laws that govern them. history, mathematics and the rest cease to be regarded as separate and distinct and become integrated into a single, comprehensive and intelligible study. Curiosity is a main stimulus to the intellectual process. Curiosity among children is a natural though somewhat uncertain growth, easily aroused and stimulated, but often requiring careful handling if it is to be maintained. Every teacher, of course, makes constant use of it, but it has a way of leaping over the boundaries of a subject and diverting a class from the main theme, to which they have to be brought back, not because the main theme is necessarily better than the new one but because it leads to the end that the teacher has in mind. When the child's curiosity is not diverted from its own course but is given its head, the results are often surprising. Something has been said earlier in this pamphlet of the mastery that the child often acquires over the details and even the background of some study to which his own interest and curiosity have led him. It is this very eagerness that the teacher would like him to apply to the "subjects" that constitute the curriculum. The problem is, of course, to harness the one to the other. One of the most promising lines of solution in the modern school is indicated by what has been called the project method, that is the relation of a whole body of work in several fields to a central core of interest, such as the soil, the town, the dance, transport, tools, the sea, or indeed any other large-scale and many-sided topic which can give a unity to a large variety of investigations and discoveries undertaken by the pupils. It must, of course, be capable of being approached from several directions, and it must allow for variety of treatment so as to provide full play for various kinds, as well as various degrees, of ability and aptitude. If the topic can emerge from the children's own free occupations and interests, so much the better. There should be historical and geographical possibilities; there should be scope for "technical investigation"; above all, there must be aspects of the topic that are familiar to the children in their ordinary lives, to provide that first-hand experience that will fire their curiosity and start the trail of research. It is likely that expeditions will have to be made in the neighbourhood, or further afield, to workshops, farms, museums, docks, libraries or picture galleries. The pursuit and tabulating of information will inevitably involve a great deal of reading and writing of a very varied kind. It will be surprising if mathematics does not crop up. The need for the requisite advances in technical skill (whether in writing, calculating, manipulating, constructing, sketching or painting) will be appreciated, and the necessary drudgery will be tackled with the vigour and determination that result from a recognition of its relevance. The method will not, of course, appeal to every teacher. It is not easy to bring off successfully. It demands a rather special measure of imagination and mental alertness. While he has to adopt the role of supervisor and counsellor rather than instructor, the teacher must at the same time ensure that the work is co-ordinated and purposeful, and that progress is, in the long run, sufficiently systematic. To illustrate the sort of way in which this method might be applied, here are some of the possibilities of one particular topic, "Houses". individual houses to consider the lay-out of their street, their village or their town, and thence to the wider aspect of town planning. Questions relating to purchase, ownership, rents, mortgages and insurance may arise and be discussed; so may others connected with such matters as the provision of public services and road safety. Again, there is scope for work in the library among books, maps and plans, for visits and surveys, for model-making and construction, and for the collection and ordering of information and material. In addition to the discovery and collection of factual matter, there will also be opportunities for creative effort in planning a house or the lay-out of a neighbourhood, or in evolving schemes of decoration and furnishing. The field of study might be small and detailed and confined to questions of local or personal significance, or it might broaden out to embrace questions that have wide social implications. This kind of approach is, of course, familiar, at least as an idea, to most teachers. It may be objected that there is no guarantee that such activity will afford a sound intellectual training. Admittedly there is no guarantee, any more than there is a guarantee that a course of the traditional subject type will do so. Nothing will train the intellect unless it is suited to the needs of a particular pupil and is presented to him in such a way as to train his particular intellect. But the approach here described, if properly handled, can certainly offer as good a chance of a sound intellectual training as any other. The collection and collation of facts, the consultation of sources of knowledge, the interpretation of evidence, the establishment of principles from particular examples, the analysis and synthesis involved, the realisation that the requirements of an investigation demand at some stage the mastery of a technique before further progress can be made - all these are first-rate training; and the fact that heterogeneous material is being used rather than the more homogeneous material of a particular subject is an advantage rather than a disadvantage. This very fact will help to show the interrelation of subjects that otherwise tend to become isolated. It will help to bring pupils (and parents who are interested in what their children are doing at school) to realise that they cannot, for example, get far in any investigation without meeting the need for arithmetic, that geography and history constantly react on one another, that language is history as well as literature, and that both the arts and the sciences are inextricably bound up with the social life of a people. This approach will admittedly not produce scholars or specialists, but this is not the aim of the modern school. achieving a common purpose. He can be brought to feel, as an individual, his share of responsibility for his own little part of the community. It would be a mistake to suppose that intellectual training in the modern school is provided only by the subjects which essentially involve reading, writing and calculation, however we re-align them or mix them up. The so-called practical subjects, quite apart from their value in promoting emotional development, give a training in accuracy and in planning a job in advance, a sense of standards and a discipline that are an essential part of the intellectual process. It is sometimes forgotten that music, besides giving life-long enjoyment and an absorbing spare-time occupation, can offer a superb intellectual training. The singing of songs, practice in reading music, and training in intelligent listening form the basis of sound musical experience. Choral singing affords perhaps the only mode of expression in which the performance of children can equal, by absolute standards, the best performance of adults, and the excellence of many a school choir has long been acknowledged. The school orchestra is likely to become a vital part of school life as string classes develop and the supply of instruments increases. The recorder, perhaps the most accessible wind instrument, is already familiar in a great many schools. There must be opportunities, too, for children to listen to music, both through broadcasts and through concerts and recitals specially arranged for schools. *The subject is dealt with at greater length in the Ministry's pamphlet "Art Education". H.M.S.O., price 2s. 6d. no reason why with modern means of production things which are mass-produced should be of poor design and shoddy quality, but until the people for whom they are intended are determined to reject the second-rate and to buy only those things which satisfy their critical eye it is unlikely that the makers will trouble to give the best of which they are capable. The primary stages of education aim at giving children the kind of social training that is received in a good home. When the secondary stage is reached girls and boys can begin to understand something of what is entailed in making the home itself. This will reveal to them the place of many practical skills in daily life, and the great variety of materials which are used and must eventually be skilfully handled. It is not expected that children should be able to acquire an adult standard of technique in these homely skills, cooking, sewing, construction in many materials, washing, repairing, cleaning and decorating, and so on, but they can at least understand their purpose and appreciate their value, and try their hands at mastering them. There will be many opportunities to develop them to greater perfection in the many forms of further education. Housecraft teaching at the present time is based on the day-to-day needs of an ordinary home. Everyone knows by experience the comforts and discomforts of a home, the demands of a family, and this understanding forms the basis of a very practical education. Children approach these topics as activities with which they are already familiar, and their very familiarity makes it possible to use them as the starting-point for talks, reading, writing, visits, discussions, etc., as well as of practical teaching. Many a man laments the fact that at school he was never given the opportunity to use his hands and do work that co-ordinated mind and muscle. He never had the satisfaction of working in intractable materials and of being subject to the stern test of the standard of the finished article. The modern school must give its pupils the opportunity to attain this sense of achievement which is a crucial factor in the development of their personality. Through it they will often find the confidence that will help them to get the best out of their school life. corporate life. Their children are drawn from a wide area, some of them coming 8 or 10 miles each day, and thus the head cannot maintain the close touch with parents that is desirable. Since many of the children are transported to and from school in specially chartered buses that have to work to a fixed time schedule, it is particularly difficult to organise out-of-school activities, like meetings of clubs or societies, which in schools in densely populated areas can often be arranged in the afternoons after school hours or on Saturdays. Teachers for country schools are more difficult to get in this urban age and move away more quickly. But undoubtedly the overriding reason why some country schools have not been successful in the past has been that comparatively few teachers in them have been countrymen or countrywomen, liking the country life and wanting nothing more than an opportunity to do their best by the country children. There is a widespread delusion that country children are dull compared with the bright town child. If anyone finds them so, it is his own fault; he has not got the right approach to a waken the interest of the children. Most country secondary schools are situated in small market towns (which are themselves essentially a part of the countryside), and the town supplies anything up to half the children, the remainder coming in daily from villages and the surrounding country. Every effort should be made to awaken the children's interest in the things around them in the countryside, in the flowers, trees and birds, in the local history and fabric of their own part of the country. Much can be done by nature study, bird study and local surveys, study of field names and of the course of local rivers and streams. The variety of out-of-door approach is endless. tion from the simple realities of the country: from the smell of its soil, the pattern of its fields, the beauty of its scenery, and from the men and women who dwell and toil in the rural areas". Children are usually classified according to their attainments in English and arithmetic, and it is common to find two, three or more "streams", arranged on this basis. It is obviously sensible to group the abler children together so that the teaching may be specially suited to their needs, and the pace of their work need not be slowed down to give a chance to less able children, who in any case require a different approach and a simpler presentation of their subject-matter. Similarly, if the less able children are grouped together, under a teacher imbued with an exceptional measure of sympathy and patience and strongly attracted towards this type of work, they can profit from a course that is specially contrived to suit them without keeping brighter children back. It is certainly desirable to organise a school in this way for much of the fundamental work. For this purpose teachers have found intelligence tests to be of considerable value, though classification based on such tests should always be checked, and rectified where necessary, in the light of the subsequent performance of the children. have as many opportunities as possible of playing with their equals in skill. The fact is, of course, that children are individuals, with individual variations of capacity in different fields. The ideal organisation would, therefore, offer individual courses to every pupil, rather than unvarying common courses for complete "streams" or forms into which the pupils have often been directed as the result of tests of their attainments in two or three subjects. There are, at any rate, two practical devices for approximating to this ideal in the actual conditions of schools as they are. One is the subdivision of a form into groups, all working under a single teacher, but each group being set tasks graded in difficulty according to the children's varying capacities in the particular subject that is being taken. This is specially suitable where the work of the form is organised round a "centre of interest". By the exercise of sufficient ingenuity the teacher can so allot congenial tasks to the various members of his form that they are led to undertake the researches that involve the special type of study or practice that they individually require, and at the same time attain the satisfaction that results from doing a necessary job well. The second device, technically known as "setting", has long been used in grammar schools. The pupils in a group of forms are reallocated according to their aptitudes into different "sets" for certain "subjects". Thus the pupils who have made most progress in French can be taught French together, though they may be in different sets for other subjects. There is probably a core of cultural and practical subjects that can be taken as form subjects with all the children. For these they can still be organised in "forms", and this will give them something very important - the sense of belonging to a particular unit within the school and of having one form master or form mistress who is specially concerned about their progress and welfare. The lengthening of the modern school course will not mean the introduction of new subjects or any spectacular change in the approach to the old, but rather the planning of a longer course as a coherent whole. All the same, it will demand greater elasticity in the curriculum and the time-table to suit individual needs than has up to now been either necessary or possible. Existing schemes of work will have to be reconsidered in this light and perhaps superseded by wholly new ones. Particularly in the later years, it will be desirable to make provision for a certain amount of specialisation, and so to arrange the time-table that pupils may have the opportunity of spending considerable periods of time on subjects of their own choice, probably things that they do well, thereby acquiring habits of work comparable with those of adult life. Every headmaster and headmistress rightly wishes to keep a finger on the pulse of the school, to know how successfully it is doing what it sets out to do, and to assure himself that standards are being maintained. In schools that have to cope with the wide ranges of ability and aptitude that are found in all modern schools, it is impracticable to combine a system of external examinations, which presupposes a measure of uniformity, with the fundamental conception of modern school education, which insists on variety. Internal tests, based on the syllabus of work actually covered by the individual pupils, rather than on any preconceived notion of the standards appropriate to a particular age, will alone adequately meet the case. The traditional oral and written examinations are suitable for certain subjects. They should be supplemented by an inspection of actual things done and made by the pupils and by an oral test of their power to describe them. Such testing will do more than merely ensure the maintenance of standards. It will help the head and his staff to follow the progress of each pupil, and to learn whether he is following the course best suited to him within the school or whether perhaps he has disclosed special aptitudes or abilities of a kind that would be best suited by transfer to another school. Well-planned individual record cards, started in the primary school and showing the pupil's development in various directions from term to term throughout his school life, will be of considerable help in this process of diagnosis. These records, based on tests and the observation of teachers in close contact with the pupil, will also, of course, play an important part in the vocational guidance of the boys and girls as they approach the end of their time at school. For the modern school pupils who will continue their education when they leave school on a part-time basis in county colleges, the Ministry's pamphlet, "Youth's Opportunity",* gives an account of the kind of work that is likely to be done there. The modern school, like the grammar and technical schools, must be regarded as one stage in a continuous educational journey through the primary school, the secondary school, and the county college, or other type of further education, into adult life with its fresh educational opportunities. *Ministry of Education Pamphlet No.3. H.M.S.O., price 1s. was planned for quite different conditions and with quite different aims. At present most parents believe the grammar school to be in some sense a superior place; this is partly due to the advantages that it has undoubtedly had in such ways as buildings, staffing, equipment, and size of classes, partly to the survival of a long-established tradition. As the modern schools develop, parents will see that they are good; it will become increasingly common for them to keep their children at school beyond the compulsory age, and to select a modern school as the one best suited to their children's requirements on grounds unhampered by considerations of "prestige". Moreover, as the organisation of industry continues to become more flexible, it will offer the product of the modern school the same hope of promotion to the more responsible and better-paid jobs as is now in practice largely confined to the products of the grammar and technical schools. THE distinguishing feature of the third main type of secondary education is its relationship to a particular industry or occupation or group of industries and occupations. Not that the secondary technical course* should be in any sense narrowly vocational. All secondary education must, to some extent, be vocational, since a good general education prepares for the whole of life, not merely for particular phases of life. It is concerned with the boy or girl as an individual and also as a citizen destined to live and work with others. Preparation for the work which he or she will do for the community in the process of earning a living is bound to enter into any kind of education at the secondary stage. *This chapter should be taken to refer not only to secondary schools devoted entirely to technical courses of one kind or various kinds, but also to technical streams and courses of the kind which are included in "bilateral" and "multilateral" schools. secondary school, not by being more closely related to "life", but by selecting the sphere of industry or commerce as its particular link with the adult world. It caters for a minority of able children who are likely to make their best response when the curriculum is strongly coloured by these interests, both from the point of view of a career and because subject-matter of this kind appeals to them. Its boys and girls will be educated for a full life by the development as far as possible of all their powers. All that has been said in earlier chapters about the importance of social and community life applies just as strongly to the secondary technical school as to other schools; and such subjects, for instance, as literature, art, music, history, religious instruction and physical education will be as important as in other secondary schools. The secondary technical school will not, of course, offer the only avenue to responsible posts in industry or commerce. Many boys and girls who respond best to the grammar or modern school course may ultimately follow technological careers. In all secondary schools appropriate links should be established between school work and the world outside and pupils should realise the practical significance of their school studies. This can be especially valuable for those boys and girls whose dominant interest is in the career they mean to follow. The school work of such pupils can gain enormously in meaning and purpose if it is based on this interest. Like the modern school, which owes much to the pioneering work of the senior elementary school, the secondary technical school has a tradition behind it. Junior technical schools have existed since 1905, and a significant feature of their aims and development has been their contact with industry and commerce. In some cases this contact may have been exaggerated, but such success as these schools have achieved has mainly been due to a close relationship with the workaday world. Remarkable as was the work done by some schools of this kind, they suffered from severe handicaps. The worst was that though they took pupils of secondary school age (normally from 12 or 13 to 15 or 16) they did not fit into the general pattern of secondary education. They were administered under separate regulations and their recruitment was seldom in line with any normal arrangements for admission to the secondary grammar schools. officials concerned. One small group regarded the schools as designed to prepare only for employment as, e.g., artisans and craftsmen. They held that the pupil should have achieved his highest ambition when he became a foreman and that the school should not encourage its pupils to look further. The other group took the view that, while the school should aim at developing high standards of craftsmanship and respect for the person who could do a useful job, there was no reason why the boy who wished to develop along other lines, including higher technology and management, should not have the opportunity to do so, if he had the necessary ability and character. They pointed out that as a general rule the more intelligent boy makes the better craftsman; and that the boy who is good in the workshops is usually the boy who is good in the classroom. The latter point of view generally prevailed, as is shown by the large numbers who secured National Certificates by part-time study after they left the junior technical school. It is overwhelmingly supported by the success of ex-pupils of junior technical schools in many different walks of life. In spite, then, of limiting conditions there developed in this country a number of very successful junior technical schools. They were not all good, but the best of them were very good schools. These gave an all-round education, by no means confined to the interests of a particular industry, but with all their work enlivened by a sense of reality and purpose. Clearly there is something here worth preserving - something which it would be wasteful to destroy. The secondary technical school will be free from many of the limitations which cramped the junior technical school. How far then can the junior technical school be treated as an example, and to what extent should its drawbacks prove a warning and its good points an example? The pupils in junior technical schools knew that their work in school was closely related to the world outside and might help them to success. They knew this partly because many of their teachers had belonged to that world and were able to explain it. It was normal for a considerable proportion of the staff to have earned their living for substantial periods in work other than teaching. The atmosphere of reality which this brought into a junior technical school was the first essential; for it determined all the rest. A well-balanced staff could, and often did, maintain from day to day its contacts with men, women and things in those sections of industry and commerce with which the school was particularly concerned, and often these contacts led to the development of many other outside interests. Next, it was important that the apparatus and materials used in school, the machine tools and so on, as well as the techniques developed for their use, should be basically similar to those employed in the industries concerned, and that standards of accuracy and finish should be related to the best industrial standards. This was not because the school pretended that it could "teach a trade" or turn its pupils into finished craftsmen. It did nothing of the kind. It set out to give them a broad basic training and to make them adaptable, industrious and willing to learn. In this process it tried to give them the first elements of a whole group of related skills and of many forms of intellectual exercise; but all these elements had to be "true to life", so far as they went - worth while in themselves, and with substance of real educational value, whatever branch of the group of industries the pupil ultimately followed, or even if he followed none of them. Again, the junior technical schools maintained a close connection with the local technical college. True, the connection was often physically closer than could have been wished, when they had to share its premises. But the contact between the heads of the two institutions and the sharing of certain members of the staff reacted often to the advantage of the schools. The best qualities in the kind of education provided in good junior technical schools of the past depended on these features, which should be developed in the new forms of secondary technical education envisaged under the Act of 1944 whatever changes may take place in other directions. The most common type of junior technical school was based very broadly on the engineering industry. The reasons for this are fairly clear. Most boys are keenly interested in mechanical things, and the development of technical education for this industry is more advanced than for others, giving advantages of tradition and providing a supply of well-qualified teachers. It is important to note that the schools did not restrict their range of interest to any one of the very large number of branches of engineering or even to any one main group such as civil, mechanical, electrical or structural. Still less did they concentrate on any of the many hundred of engineering skills. Several successful schools in fact described their main interest as "the engineering and general construction trades" - a very wide range indeed. the possibilities of aesthetic training in form, material and colour, and the many threads of interest that lead into history, geography and literature. The number of such schools has lately increased considerably and valuable experience has been gained. 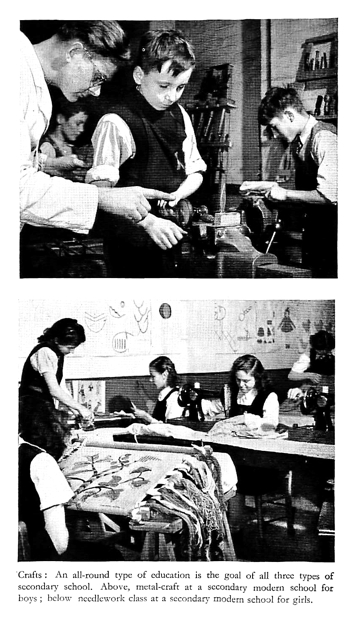 Only a few schools were planned around the training of girls in domestic subjects and women's crafts. Their pupils usually entered occupations such as cookery, domestic work, catering, laundrywork, needle trades or nursery nursing, after two years at the school. Some extended their course to three years and one or two aimed at the pre-nursing course. By far the largest volume of junior technical education for girls was in schools of the commercial type. These were usually mixed schools, but the girls far outnumbered the boys and their work was almost always directed towards preparation for clerical occupations, with shorthand, typewriting and some simple study of accounts and of commerce included in their curricula. Attempts were made to establish commercial schools directed towards other branches of commercial life, such as the retail trades. The educational possibilities are considerable, and it is hoped that they will be explored thoroughly within the new framework. The trade school, which concentrates on training in particular crafts and gives a very substantial part of its time to the development of manipulative skill and to the handling of machine tools, has remained a rarity in this country and is almost unknown outside London. It is not likely to play a part in any normal development of secondary education; its place will be beyond the age of compulsory full-time attendance. Since none of the schools (other than the trade schools) had a narrowly vocational objective the amount of time given to purely technical subjects was in most cases a relatively small part of the whole. 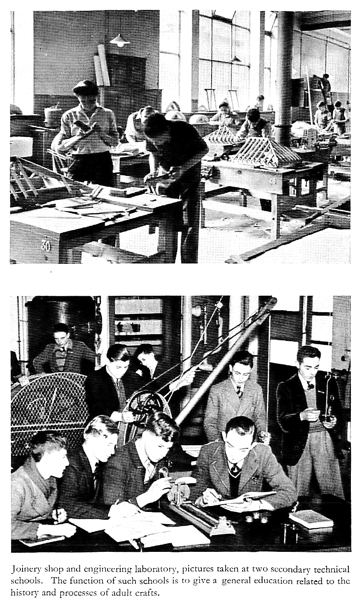 In an "engineering" junior technical school, for example, it was common for only about one-fifth or one-sixth of the school time to be spent in the engineering workshop, though some of the "building" schools gave rather more time to crafts; even so, the training was used to lead the pupil to wider interests through its contacts with his drawing, mathematics, science and English, and his out-of-school activities. The school course was not planned on rigid lines with an examination objective, but as a coherent educational whole, using the spontaneous interest of the pupil in one branch of his work to stimulate his interest in the others. On such foundations the best junior technical schools built educational courses which called forth the enthusiastic efforts of many pupils and provided an education which was in a very real sense a liberal one. It is on these foundations that the secondary technical school of the future must continue to build. Junior art departments usually contained both boys and girls. They were invariably attached to art schools and art colleges. They sometimes admitted pupils younger than was common at the junior technical schools. A large part, often half or more, of the school time was devoted to art, though usually in accordance with a broad and varied scheme, and only a relatively small part to "general" subjects such as English, mathematics, history and geography. There is clearly a case for building a secondary school course round the special interests of children with aptitudes for the creative arts; moreover, the claims of music and certain other arts will in the future have to be considered equally with those of art in the narrower sense. Most of the junior art departments, however, have been quite small, and have found difficulty in arranging for alternative courses, or for such things as physical education, housecraft and general school activities, unless they were able to join for these with some other school. Their future as part of the secondary school system seems at first sight likely to involve a substantial measure of such fusion, since the continued existence of small units in their present form cannot be justified under the new conditions. On the other hand, there may well be from now on more boys and girls with these creative aptitudes for whom provision ought to be made; and the adoption of 11 as the age of entry will in itself mean an increase in the numbers of entrants to this form of secondary education. The case for the independent secondary art school has been set out in the Ministry's recent pamphlet "Art Education". The junior technical and commercial schools and the junior art departments did not, of course, cease to exist directly the 1944 Education Act was passed; most of them are still functioning and along very much the same lines as before. But the Act has changed their status and opened up wide fields for development. From being a part of the provision for further education they have become an integral part of the secondary school system, and must in future develop into equal partners with the grammar and modern schools. This means that the new secondary technical schools will be very different from their predecessors. In the past the normal age of admission to the junior technical school was 13 and there was a two-year or three-year course to 15 or 16. There will in future be a four-year or five-year course from 11 to 15 or 16, while it is to be expected that a reasonably substantial proportion of pupils may wish to stay on beyond this age in a school which offers an appropriate incentive. The secondary technical school will have to comply with the new Building Regulations just as will the modern or grammar school. New secondary technical schools are an important factor in the development plans of the local education authorities, and the same energy and drive will be applied to the rehousing of technical schools with inadequate premises as to that of any other poorly-housed schools. The longer school life and the better premises are means to an end - to enable the technical* school to provide an adequate secondary education of its special kind. Its pupils will be in this type of school mainly because of their special interests, and this will mean that high standards may be expected in studies and activities related to those interests, but it must not mean concentration upon certain subjects to the exclusion of other necessary elements in a general education. In science, for example, the field of study will be as wide as in other secondary schools; only in the later parts of the course will progressively greater attention be paid to those aspects which apply to the technical purposes in view - though if earlier in the course it seems that some technical application will help and not distort the teaching as a whole such application will be made. Similarly, in other parts of the school course the contacts with industry and commerce will be used to strengthen and enrich, and not to dominate, the education of these particular boys and girls. *For the sake of brevity the word "technical" will be used in the rest of this pamphlet, when there can be no misunderstanding, to cover the whole field of secondary education based predominantly on industry, commerce, agriculture, homecraft, art and music. The pupils who need this sort of secondary education may be very able boys and girls for whom the grammar school course will not provide the best opportunity for full development. The essential consideration is not so much their "intelligence quotient", though this must count, as the natural bent of their minds and their outlook, and that of their parents, on their own future. To ensure that the right opportunities are open to the right pupils, proper selection is essential, and selection on positive, not on negative grounds. To assume that the "top layer" in intelligence will always go to the grammar school would be contrary to the purpose of the 1944 Act. It should be possible for the brightest and ablest pupils to go to whichever type of secondary school will best accord with their interests, their special aptitudes and the kinds of career they have in view. There can be no useful selection on any other basis. Some local education authorities and schools have experimented already in methods of recognising and assessing various kinds of aptitude, by including particular tests in their schemes of selection and by systematically recording the "follow up " of school results and after careers. There is room for a great deal of serious investigation along these lines. *It is true that the Spens Committee recorded (on page 284 of their Report) serious doubts whether commerce and home training provide a sufficient "range of systematical knowledge and theory which, on the one hand, is within the grasp of pupils of the relevant ages, and, on the other hand, affords an intellectual discipline comparable to that of a grammar school education" to justify their forming the basis of what they termed a "technical high school" course. They envisaged the continuance of junior commercial schools and home training schools with an entry at 13. But now all schools previously known as junior technical schools, junior commercial schools, junior art departments, or junior housewifery schools, must, if they are to continue to exist, exist as secondary technical schools or as components of secondary technical schools. Moreover, it is reasonable to hope that, with the possibility of a development of the course beyond the age of 16, the drawbacks felt by the Spens Committee may to some extent be discounted. With the selection for the different types of secondary education taking place at 11, the early part of the course at the secondary technical school will necessarily be fairly general, if only to facilitate the transfer to and from the school of pupils who turn out to have been wrongly allocated at 11. The notorious difficulty at present of recognising technical aptitudes at 11 makes it likely that such transfers will, for a time at least, affect technical schools more than other types of secondary school. The problems of organisation facing the secondary technical school are very different from those which faced the junior technical school. The course will be much longer, and it will be normal, not exceptional, for the school to have its own premises and its own staff, so that its activities will be planned and its time-table drawn up without reference to other demands on the services of its teachers or on the classrooms, laboratories and workshops. The size will depend on the nature of the courses and the economics of equipment and staff. Where a great deal of special equipment, such as engineering machine tools, is required, obviously it will be uneconomical to establish a secondary technical school too small to use it fully, unless arrangements for its use also by students attending a college of further education or a senior evening institute, for example, can ensure economical "loading". At the same time, it will be remembered that the younger pupils will probably not make much use of special technical equipment and accommodation, and that consequently the amount of such equipment and accommodation required in a secondary technical school will be less in proportion to the total number of pupils than it was in a junior technical school. sufficient variety of alternative courses, and it would be faced with the additional disadvantage that it would find it difficult to employ special equipment and staff economically. One way of meeting these difficulties would be to make, where all the necessary conditions as set forth in this pamphlet can be satisfied, some kind of bilateral arrangement. A technical course might be planned alongside a grammar or modern school course, if the head of the school understood and was in sympathy with the character and objectives of the technical course and if the appropriate staff and equipment were provided. On the other hand, in large urban areas, or elsewhere if arrangements exist, by means of boarding, daily travelling, or both, for collecting pupils into groups for suitable secondary technical courses, the efficient maximum size will be determined by the possibilities of proper organisation and control of the school as a unit. A school of 500 or 600 is not too large. In some areas it might be related to a single industry, but such a size would allow many types of organisation, e.g., a boys' school with two groups of engineering and two groups of building pupils or a mixed school with two of either of these and two of commerce, or a girls' school with two of commerce and two of either art or housecraft, or a mixed school with two of commerce and two of art; or various other combinations of appropriate courses for boys, girls or mixed groups, conditioned of course by the economical employment of accommodation, equipment and staff. It has been fairly common for two or three different types of junior technical school to be combined under the same head, and composite secondary technical schools are likely to be even more common in future. They should work quite well provided that adequate arrangements can be made to meet the various needs of the pupils. Groups with different objectives (e.g., engineering, building, commerce) can be combined fairly easily to form a school provided that economical use of special rooms, equipment, staff and so on can be arranged. will be need for the secondary technical course conducted in a boarding-school which could if necessary take some day pupils, and also for that conducted in a day school with arrangements for some boarders. After the age of 16 the best line of progress for many pupils may be through a well-planned combination of training in industry, commerce or the arts, with part-time attendance at an establishment for further education. For some this may lead to the higher levels in technology or management. The only effective arrangement may in some cases be to transfer the pupil at the age of 16 to a full-time course in a college for further education where appropriate equipment and specialist staff are available. But there will be others who should have another year or two at a secondary school. This means that provision at the sixth form level must be available for those boys and girls who want it and can profit by it. Such courses will need to be planned in a variety of ways depending upon the needs of individual pupils and the practicability of making suitable provision. A much greater degree of vocational specialisation will at this stage be justifiable. In certain circumstances the pupil may go to a suitable sixth form course in another secondary technical school, which might be at a distance from his home; and it should be possible, where a pupil's development in the secondary technical school has shown it to be more suitable, for him (or her) to transfer to a sixth form in a grammar school. Any of these lines of progress must be so related to the general facilities that it can provide a route to a university or college of technology. The forming of suitable groups for specialised courses in the period from 16 to 18 years may have to be done on a regional, or even a national, plan with appropriate boarding arrangements. The important thing is that the special abilities and aptitudes of any pupil shall be given the fullest opportunity of development whether he comes from the largest urban centre or the smallest country village. the secondary technical school as envisaged under the new conditions. Improved arrangements for selection and the longer school course should make it possible, without losing any of the merits of the old junior technical school, for its successor to provide a very much broadened curriculum and, while covering the old ground more thoroughly, achieve improved standards all round. The curriculum must always be planned as a whole, and the industrial interest should be used to stabilise and give coherence to the course, not to throw it out of balance. Just as in some secondary modern schools in order to secure both interest and balance the work may be related to some "project", so in the curriculum of a secondary technical school the industry is always there as a continuous "project" holding all elements of the curriculum together, but doing so without distorting them. During the first two years the curriculum will contain many elements in common with that of other secondary schools, building on the foundations laid in the primary school, and developing those qualities and attainments which are essential to happiness and usefulness in any walk of life. It must include sound practice in the use of the English language and of number, measurement and drawing for precision as well as some work in art of a free character. The boys and girls must be given a basis of religious knowledge, an appreciation of natural things and of quality in music, in material and in workmanship, some simple knowledge of people's lives in other places and in other times, and opportunities for craftwork of several kinds. The curriculum will perhaps include the beginnings of a foreign language, and it must give serious attention to healthy physical and social development. Even in the third year of many schools there will be comparatively little vocational content. It will consist mainly in the introduction of industrial, commercial or other applications of basic principles, and in a gradually increasing emphasis on particular aspects or parts of certain subjects rather than the introduction of entirely new subjects. The teaching of a subject significant only in relation to some particular industrial or commercial operation would certainly not be justified. All the features mentioned in the last paragraph will be developed, although it may be possible to carry a foreign language further only in certain courses, for example some of the commercial ones. to have their place. The same importance must continue to be given to English, mathematics, science, history and geography as in other secondary schools, and similar attention must be paid also to religious instruction, physical training, and the practice and appreciation of art and music. In order that an adequate amount of time can be given to those subjects it will be necessary to allow less time for specifically "technical" subjects, in the period up to 16 years, than was normal in the junior technical schools or junior art departments. There will be such variety of courses that it is quite out of the question to suggest time allocations. It would in any case be premature to mark out a territory which the schools will themselves explore from different directions in the next few years. (a) The total amount of time given to directly vocational subjects up to about the age of 16 should certainly be no more than the total that was normal during the full course of a two-year junior technical school. (b) No such subject should be included at any stage of a course unless enough time can be given to it then to secure profitable progress with economy of effort for teacher and pupil. It follows that some subjects or parts of subjects in the curriculum of the junior technical school or junior art department will be postponed until a later stage in the secondary technical schools. It will, for example, be out of the question to devote a daily period to shorthand in the early years at the secondary technical school. And since a comparatively small part of the time will be given to directly vocational subjects, the whole curriculum must be properly integrated and the special interests of the pupils suitably developed and used. these classes are plainly related to what they want to do when they leave school and they are thrilled as they master each new step. When they realise, as they very soon do, that their teachers have done these things in real life, their interest is stimulated and their sense of reality increased. There is an immediate urge for success in those particular subjects, and a little skilful handling can soon direct some of this urge to subjects which can be seen readily to relate to them. The need for ensuring this must be kept in view when the content and, more particularly, the treatment of the syllabus are planned. In an engineering course, for example, the science and mathematics can very readily be related to the technical centre of interest. More skill is needed with subjects like English, history and geography, yet in a number of the old junior technical schools the teachers were able to make very good use of the "urge" in the school to enliven their own teaching. They were helped by the fact that their own outside contacts and interests were developed through their association in the staff room and in the general activities of the school with teachers and students having a great variety of experience. This does not mean that the teaching need be warped so as to give artificial prominence to special features connected with the vocational interest in the school. On the contrary; if, for example, in a building course the history teaching includes a study of the different kinds of buildings put up at different periods, this theme can be used to lead to the much wider study of the social evolution of the people who built these buildings and who used them at different times. The theme will be there, but only as a thread of interest. The aim should always be to keep it in its true relation with the whole. Similarly, in English it is the manner and method of approach and the relating of the teaching to other parts of the course that count more than the actual content of syllabuses. Pupils will be interested in being able to describe "with clarity, conciseness and fitness" the way a machine works, the design of a costume, a job to be done or the structure of a bridge, or to write a business letter; but this interest can be used to lead to the development of powers of expression in many other kinds of written (or spoken) exercise. This is equally true of the pupils' reading and of the development of their taste in books and of their power to make use of books for profit and for pleasure. will be comparatively few girls attending an engineering or a building school, there will be plenty attending schools with courses of which the "technical" centre of interest is in commercial work in its wider significance, or in the arts. And there must be courses linked with occupations that are mainly, if not wholly, confined to girls; for example, welfare work, child care, homecraft. With the advent, in the future, of pupils of greater ability, who are selected on grounds of interest and aptitude for a technical rather than a grammar or modern school, it is of the utmost importance that standards of work should be maintained at a high level. The school must make possible the fullest development of all the powers of its most intelligent boys and girls. The maximum size for a form will be the same for all secondary schools. Subject to adjustments to meet varieties in the volume of practical work and of advanced work, this will roughly determine the size of the staff. Something has been said and implied, under other headings, about the kind of staff required. It is quite clear that a person who is suitable to be head of a secondary technical school or in charge of a secondary technical course must appreciate the special opportunities which it gives and must be genuinely interested in the problems of pupils at the secondary school age. These things are even more necessary than experience in industry or high academic attainment, though it may be presumed that the ideal head would possess all these qualifications. The staff as a whole should form a well-balanced team, combining sound scholarship in all fields that are relevant with the skill of the finished craftsman, intimate contact with the everyday world and wise judgment in relation to it. Occasional visiting teachers may be useful and it may be helpful also if specialists from a senior institution come into the school to deal regularly, even if only in one or two lesson periods each week, with particular parts of the work. By far the greater part of the teaching, however, should be done by regular members of the staff who devote the bulk of their time to the school. All of these regular members will, of course, do their proportionate share of supervision duty and play their part in the general school life. can learn something by observing how in many cases the difficulties arising from joint staffing were overcome. The Building Regulations have prescribed minimum standards of sites, playing-fields and accommodation for secondary schools of all types; and the secondary technical school must conform to these standards. The Regulations allow a measure of discretion in the planning and arrangement of accommodation for "practical" studies. Although definite guidance is given, in Appendix II to the Memorandum that accompanied the Building Regulations, about the "practical rooms" in certain types of secondary technical schools, the proper sizes of such rooms and their lay-out must be decided in relation to the purposes and conditions of each case. Special considerations are involved, for example, in an agricultural or a nautical school. It must on no account be assumed that a laboratory, craft-room or workshop which is adequate for one school is necessarily adequate for another. 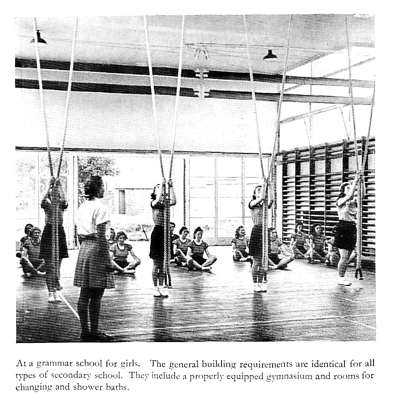 While in fact the standards for size are the same for classrooms, gymnasium, offices, assembly hall, library and so on as in other secondary schools, special needs in accommodation - such as workshops, drawing-offices, laboratories or space for work out of doors - must be determined according to the circumstances of particular schools. The same is true of all equipment which is not commonly required in all types of secondary school. Almost all the existing secondary technical schools were, until 1944, junior technical schools and so far are little altered, either in the matter of premises or of organisation (which is often vitally affected by premises). The majority (about 85 per cent) of them are at present organised as parts of senior technical institutions and are housed in their buildings. They range in size from fifty or sixty to 500 or more on roll. Quite commonly the course is of two years' duration, from 13 to 15, but in some it extends for three years, from 13 to 16. A few of the larger schools have a normal course of two years with an optional third. Many of these schools will find it difficult immediately to lower the age of entry without reducing the annual intake. Schools which are not housed in the premises of senior institutions could make the attempt, facing squarely such problems as the lessened use of special equipment or the possible need for additional temporary premises. This matter is much more difficult when the school is housed in a senior institution. It seems likely that secondary technical school provision will develop substantially under the new conditions, and that it will offer a suitable form of secondary education for many more boys and girls than were ever in attendance at the junior technical schools. Furthermore, the average level in the intelligence of its pupils will be higher than in those older schools, while the general application of better techniques for selection should in the long run ensure that special interests and aptitudes, as well as intelligence, are given their true weight as a basis of admission. Estimates of the provision required cannot always be formed satisfactorily on purely local considerations and will often require consultation among authorities, for obviously it would be impracticable to provide every type of secondary technical school in every district. Each school should be part of a comprehensive scheme of secondary provision which will include machinery to ensure that any boy or girl for whom a particular form of secondary technical education is appropriate is given the opportunity to get it, whether as a day pupil or as a boarder. "How can general education be so adapted to different ages and, above all, different abilities and outlooks that it can appeal deeply to eacb, yet remain if I goal and essential teaching the same for all? The answer to this question, it seems not too much to say, is the key to anything like complete democracy." Harvard Report on General Education in a Free Society - 1945. The following have already been published in this series. Further pamphlets are in preparation. SECONDARY EDUCATION, WITH SPECIAL REFERENCE TO GRAMMAR SCHOOLS AND TECHNICAL HIGH SCHOOLS (Spens Report), 1938. Reprinting.